Gorgeous mountain home nestled in the hills of Morrison. 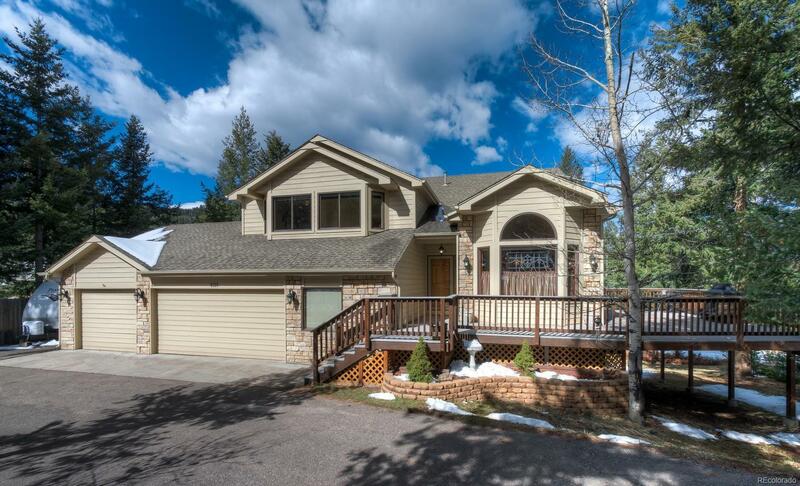 This home sits on a private wooded lot with a circular driveway and lovely wrap-around composite deck. Sprawling multi-level open concept layout. Beautiful hardwood floors. Vaulted ceilings and windows galore create brilliant natural light. Formal living and dining room. Spacious kitchen and eating area features granite slab counter tops, stainless steel appliances, an island and a wine nook. The kitchen opens to a large deck, perfect for entertaining. The sunken family room has a gas fireplace with a rustic stone face and mantel. Private master retreat boasts vaulted ceilings, a lovely 5 piece en suite bath and a walk-in closet. The garden level offers great additional living space with a large guest suite and bathroom, living room that opens to a covered deck, exercise room and a wine cellar. Oversized 3 car garage includes a 4th bay and a loft and is heated.